Aims and Objectives: This retrospective study aims at correlating the pre- and post-therapy maximal standardized uptake values (SUVmax) of the whole-body 18-flourodeoxy glucose positron emission tomography (FDG-PET) scan with tumor response in patients with head and neck squamous cell cancer undergoing chemoradiotherapy. Materials and Methods: Data for this retrospective study were taken from the clinical records of 20 evaluable head and neck cancer patients who had availed treatment and evaluation at our institute during the previous year (March 2017–April 2018). All these above-mentioned patients had undergone chemoradiation at our center for locally advanced squamous cell carcinoma of the head and neck and had undergone pre- and post-therapy whole-body FDG PET scan. The posttherapy PET-computed tomography (CT) was advised after 8 weeks' postcompletion of therapy. During the PET CT scan, images were acquired 1 h after injection of FDG. Pre- and post-therapy SUVmax were recorded and correlated with immediate treatment response. Results: The mean pretherapy SUVMax of the primary tumor was 10.27 ranging from 4.5 to 26.17. The mean pretherapy SUVMax of the node was 5.34 ranging from 0 to 17.9. The mean time of recording the posttherapy SUVMax was 3 months (range 2–5 months). The mean posttherapy SUVMax of the primary tumor was 1.05 ranging from complete metabolic response to 6.4. The mean posttherapy SUVMax of the node was 0.7 ranging from complete metabolic response to 5.43. The statistical analysis based on Wilcoxon–Signed Rank test revealed a statistically significant difference in the pre- and post-therapy SUVmax values for both primary tumor (P < 0.001) and regional node (P = 0.001). Majority of patients (n = 15) showed clinical remission; however, five patients had progressive disease at the time of evaluation. Conclusion: Although the retrospective study revealed that complete responders had a statistically significant reduction in the posttherapy SUVmax in comparison to the pretherapy SUVmax it failed to identify a cutoff value for pretherapy SUVmax which could predict the probable outcome of therapy. In view of the same further prospective studies need to be conducted with larger patient numbers including various other tumor metabolic markers for greater clarity. Head and neck, squamous cell carcinomas constitute a major cause of cancer-related morbidity in India accounting for nearly 30% of cancer cases in both genders together. Locoregionally, advanced disease stage is commonly encountered in clinical practice, and these patients are offered multimodality therapy. Although concurrent chemoradiation has improved locoregional control of inoperable locally advanced head and neck squamous cell carcinomas, it has its own toxicity both acute and chronic which can negatively impact therapeutic outcome and affect quality of life. In addition, these locally advanced head and neck cancers are also associated with distant metastasis. 18-fluorodeoxyglucose (FDG)-based positron emission tomography (PET) is gaining popularity today in the evaluation of squamous cell cancers of head and neck. Although PET-computed tomography (CT) cannot replace tissue biopsy and the latter is still the gold standard for confirmation of malignancy, the application of PET CT in head and neck cancer staging is slowly but surely increasing. Some of the common applications of FDG-PET CT in head and neck cancers are in the evaluation of secondary neck node with unknown primary, evaluation of recurrent cancers, and evaluation of locally advanced cancers to rule out distant metastasis and second primaries. One of the areas of the current research focus is on the prognostic role of PET CT. There is evidence to state that indicators of FDG metabolism such as maximal and mean standardized uptake value (SUVmax and SUVmean), metabolic tumor volume (MTV), and total lesion glycolysis (TLG) can predict disease-free survival.,, Therefore, PET and measurements of FDG-related glucose metabolism may have prognostic benefit in these patients. Against this background and since available literature on prognostic evaluation of head and neck cancer using PET-CT in Indian population is sparse, available data in our institute were retrospectively analyzed to assess the prognostic value of PET-CT in locally advanced head and neck cancer patients, who had received concurrent chemoradiation. The study aimed at correlating the SUVmax of PET-CT with treatment response. 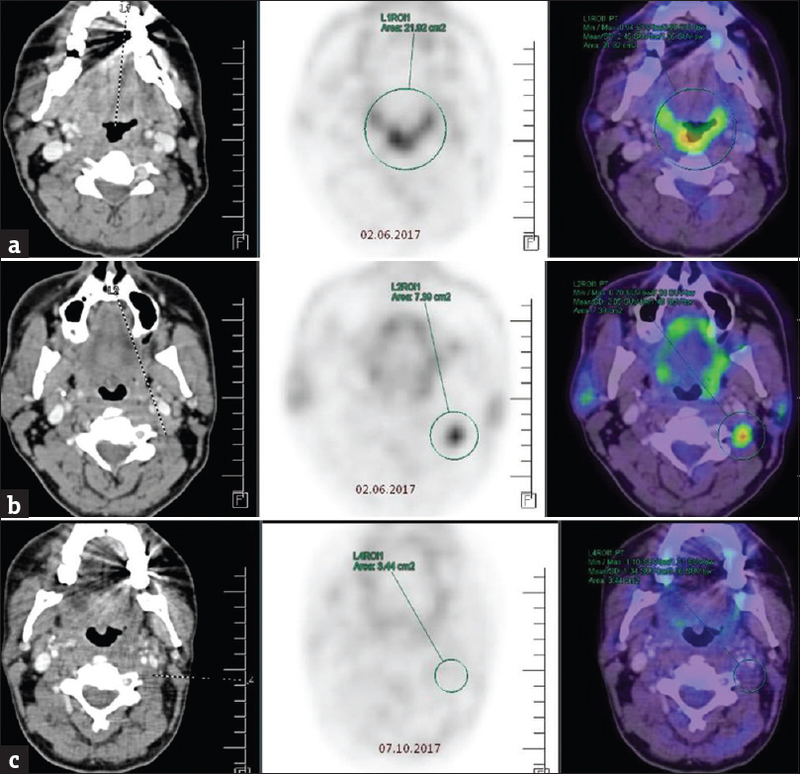 This retrospective study aims at correlating the pre- and post-therapy SUVmax of whole-body FDG-PET scan with tumor response in patients with head and neck squamous cell cancer undergoing chemoradiotherapy (RT). Nature of study - This study was a single arm retrospective study which analyzed the data of patients with locally advanced head and neck cancer who had undergone radical chemo-RT as well as pre- and post-therapy whole-body FDG PET CT at our institute. Data collection and analysis was done in September 2018. Data of patients who received treatment in the 8 months' period between April 2017 (when the institute started PET CT services) and December 2017 were analyzed. The latter endpoint was fixed as the posttherapy PET CT for the patients treated in December 2017 would be done in March 2018 and at the time of data analysis, all patients would have a minimum of 6 months' follow-up data. Patients who had undergone evaluation with pre- and post-therapy 18F FDG PET CT. Patients who had not undergone pre- and post-therapy FDG PET CT.
A total of 76 patients with head and neck cancer received treatment in our institute in the above-mentioned period. Of these patients, 69 patients fulfilled histopathology and stage criteria for inclusion. Of these 69 patients, 21 had undergone primary surgery and were excluded. Of the remaining 48 patients, 13 patients were unfit for chemotherapy and received radical RT and remaining 35 patients underwent chemoradiation. Of these 35 patients, three patients had discontinued treatment midway through while four patients did not return for evaluation. Of the remaining 28 patients, only 20 had undergone pre- and post-therapy PET CT as a part of the evaluation, and hence, the total number of patients whose data were analyzed in the study was 20. The study was a single-arm retrospective study, where only data of patients who received similar investigative and treatment modalities were taken up for evaluation. All patients were aware of the evaluation and treatment modalities to which they were subjected, and there was no control arm included. Hence, randomization or masking was not feasible. Informed consent for RT and chemotherapy treatment and undergoing PET-CT and using their data for subsequent research were taken from each patient. As the study was a retrospective study analyzing data of patients who had already undergone the standard recommended protocol for evaluation and therapy for their disease a Formal Ethical Committee approval was deemed not necessary. All the patients received Platin (Cisplatin/Carboplatin), and Taxol (Paclitaxel/Docetaxel)-based chemotherapy concurrent with intensity-modulated RT. RT was delivered using 6 MV Linear Accelerator Photons. The radiation dose delivered was 66 Gy to gross tumor volume and 54–60 Gy to clinical tumor volume in 1.8 Gy/fraction. All patients received a minimum of three cycles of chemotherapy along with RT. PET-CT was taken before the commencement of treatment and 8 weeks after completion of treatment. Patients underwent the FDG-PET-CT scan in fasting state with blood glucose level below 180 mg/dl. These patients were administered iv injection of FDG at a dose of 0.22 mCi (8.14 MBq)/kg (10–15 mCi/370–555 MBq) FDG. One hour after, the injection of isotope patients was imaged from vertex to thigh with 120 kV, 50 mA, CT scanner with slice thickness of 3 mm. Immediately after CT, patients were subjected to PET scan (Siemens Biograph Horizon) involving seven to eight-bed positions totally lasting 7 min. After attenuation correction and reconstruction, CT and PET images were fused and evaluated in transaxial, sagittal, and coronal planes. The pre- and post-treatment SUVmax values of the primary site and nodal disease which were measured as continuous variables were recorded as arithmetic mean for comparison and statistical analysis. The values obtained did not follow normality. As the study involved repeated measurements on a single sample to assess whether their population mean ranks differ Wilcoxon signed-rank test was used for analysis. All statistical analyses were performed using SPSS (Statistical Package for the Social Sciences) software version 16.0 (IBM, SPSS statistics, USA). 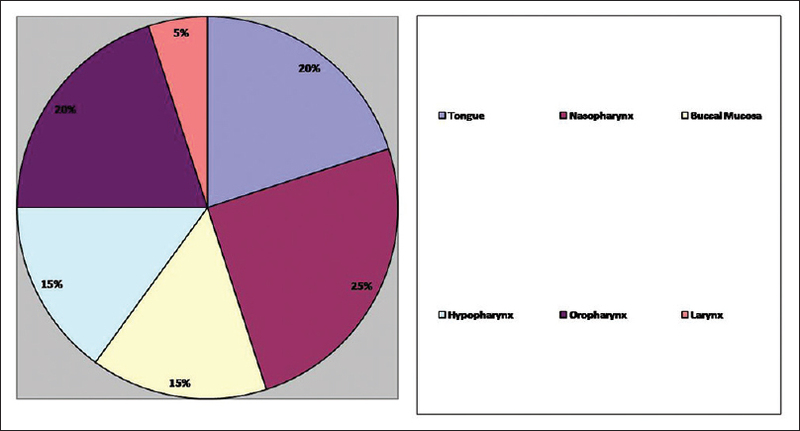 This study was carried out among 20 participants with head and neck cancer, of which the different sites included were nasopharynx (n = 5), tongue (n = 4), buccal mucosa (n = 3), hypopharynx (n = 3), oropharynx (n = 4), and larynx (n = 1) [Figure 1]. The stage and distribution of the site of the tumor are given in [Table 1], [Table 2] and [Figure 2], [Figure 3] describes respective pre- and post-therapy SUVmax values as recorded in the primary tumor site and the involved lymph node. The mean pretreatment SUVMax of the primary tumor was 10.27 ranging from 4.5 to 26.17. The mean pretreatment SUVMax of the node was 5.34 ranging from 0 to 17.9. The mean time of recording the SUVMax from completion of chemoradiotherapy was 3 months (range 2–5 months). The mean posttreatment SUVMax of the primary tumor was 1.05 ranging from complete metabolic response to 6.4. The mean posttreatment SUVMax of the node was 0.7 ranging from complete metabolic response to 5.43. The comparison of pre- and post-treatment values of the primary tumor as given in [Figure 2] shows a considerable reduction in the posttreatment SUVmax values when compared to pretreatment values, which is consistent across all the tumors. 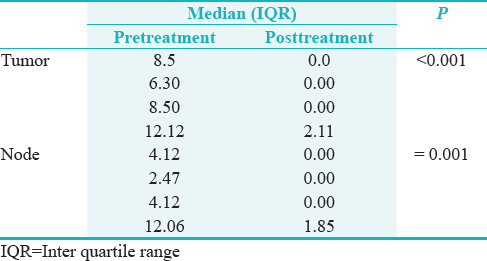 However, in [Figure 3], on comparing the pre-and post-treatment SUVmax values of the regional nodes, four patients did not show any uptake in the node before and after treatment while 15 patients had lower posttreatment uptake values and one patient showed increase in the posttreatment uptake value. 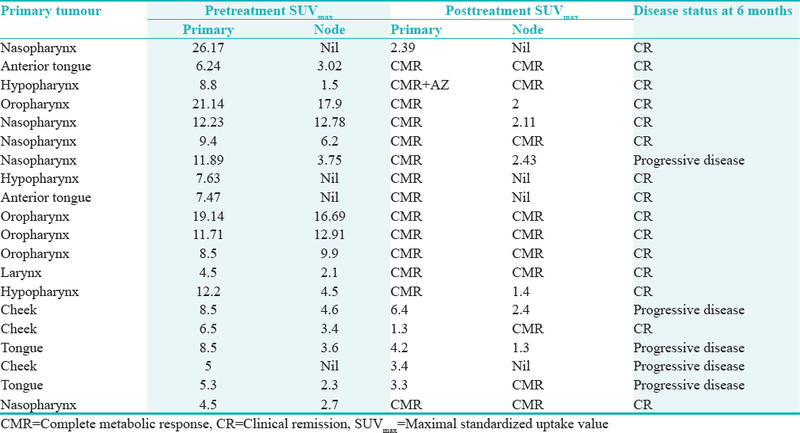 The statistical analysis based on Wilcoxon signed-rank test revealed a statistically significant difference in the pre- and post-treatment SUVmax values for both primary tumor (P < 0.001) and regional node (P = 0.001) [Table 3]. All patients underwent clinical examination at the time of posttherapy PET CT, and majority of patients (n = 15) were found to be in clinical remission while the remaining five patients had residual disease. [Figure 4] and [Figure 5] depict the pre and post treatment PET CT images of two patients with oro pharyngeal disease who attained complete response. 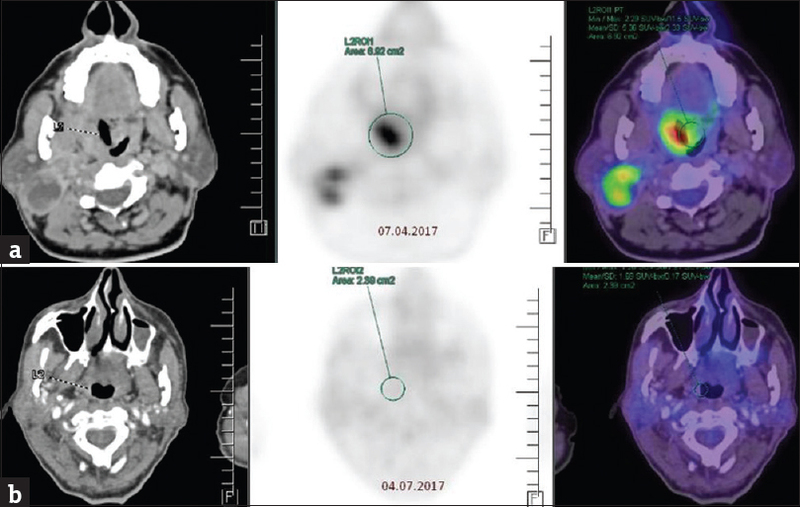 18F-FDG PET-CT has an important role to play in staging, treatment planning and follow-up evaluation of locally advanced head and neck squamous cell carcinomas. Although its application in the evaluation of head and neck cancers suffers from some inherent limitations such as false positivity in inflammatory conditions and physiological uptake it is considered as the gold standard in detecting second primaries and ruling out recurrence by virtue of its high negative predictive value., In addition, PET-CT facilitates guided biopsy with a sensitivity of 88% and specificity of 78%. Modern research is directed toward improving the prognostic potential of FDG PET in head and neck cancers particularly in analyzing the response to treatment and predicting treatment outcome. Numerous indicators of FDG metabolism such as SUVmax and SUVmean, MTV and TLG are estimated in clinical practice. Among these parameters, SUV which is a measure of the radioactivity in a tumor or lesion is most commonly used as an indicator of tumor metabolism. The SUV is defined as the ratio of radioactivity concentration measured in tissue and the injected activity divided by the body weight. Although studies have high shown poorer treatment outcomes with higher FDG uptake and thereby higher pretreatment SUV values, the benefit of SUV as a predictor of treatment response and survival has not been categorically established as on date. SUV of the tumor or node is measured in two ways namely SUVmax and SUVmean. SUVmax reflects the highest voxel value within the volume of interest, and it is the most widely used parameter to measure metabolic tumor activity in oncologic FDG-PET/CT imaging. Zhang et al. in his meta-analysis of 7 studies involving 674 head and neck cancer patients identified poorer survival in patients with higher SUVmax values at primary tumor sites. On the contrary, there are other studies which claim that the SUVmax at the nodal site and in particular the distal node is the main prognostic marker. In addition, there is no consensus on the probable cutoff value for SUVmax above which a poorer outcome is associated with values ranging from 7 to 13 being described. Against this background, keeping in mind the fact that literature on the prognostic benefit of PETCT in Indian population is sparse, available data in our institute were retrospectively analyzed to assess the prognostic benefit if any of 18F FDG PET CT in locally advanced squamous cell carcinoma head and neck cancer patients, who had received concurrent chemoradiation. In our study, we recorded the pre- and post-treatment SUVmax at the primary and nodal sites of disease for all patients. In addition, at the time of posttherapy PET-CT patients also underwent clinical evaluation of response. The clinical response was then correlated with the pretreatment SUVmax at tumor and nodal sites to analyze whether these values had any bearing on outcome and if possible to identify a possible cutoff value of SUVmax which would predict treatment response. In comparison to the pretreatment SUVmax, the present study demonstrated a significant reduction in the posttreatment SUVmax values at both primary tumor and nodal sites for most patients. A total of 14 patients (70%) had a complete metabolic response (CMR) at the primary tumor site which was confirmed by clinical evaluation. Among these 14 patients, 9 patients (45%) had a (CMR) at the nodal site, while 3 patients (15%) had N0 disease in both scans while in the remaining 2 patients (10%) a 60% reduction in posttherapy SUVmax at nodal site on comparison with pretherapy SUVmax node value. One patient with nasopharyngeal cancer with N0 disease had a 90% reduction in posttherapy SUVmax at the primary site and was found to have a complete clinical response. All these 15 patients (75%) were found to be in remission at 6 months of follow-up. Five patients (25%) had residual disease on clinical examination of which 4 patients (20%) had a posttherapy SUVmax primary tumor value ≥50% of pretherapy value while one patient had a posttherapy SUVmax nodal site value ≥50% of pretherapy value. All these five patients had progressive disease local and distal at 6 months' follow-up. In our study, the mean and median pretreatment SUVMax of the primary tumor was 10.27 and 8, 5, respectively with values ranging from 4.5 to 26.17. The mean and median pretreatment SUVMax of the nodal site was 5.34 and 4.12, respectively, ranging from 0 to 17.9. Unlike other studies which have correlated poorer outcomes with higher pretreatment SUVmax values, our patients with high pretreatment SUVmax at primary and nodal sites did not have an adverse outcome. These findings are in concordance with the study by Moeller et al. who showed that a significant association was not found between pretreatment SUVmax and prognosis. On the contrary in our study, higher posttreatment SUVmax values at the primary and nodal site (posttherapy SUVmax value ≥50% of pretherapy value) was found to be associated with higher relapse rates. Our study shows that a single arbitrary value of SUVmax measured before treatment may not predict the extent of treatment-related metabolic change, but it is the serial change in the SUVmax before and after treatment which can predict response and survival. The results of our study were found to be statistically significant. Support for the findings of our study can be drawn from the study by Matoba et al. who analyzed both pre- and post-therapy PET CT in 40 head and neck cancer patients undergoing chemoradiation and found the posttherapy SUVmax value at 3 months' posttherapy to be a stronger indicator of relapse and progressive disease than the pretreatment value. In addition, Kikuchi et al. in their study on nasopharyngeal cancer patients undergoing neoadjuvant chemotherapy also showed that a reduction in posttherapy SUVmax (>50%) predicted better outcome while Hentschel et al. showed similar findings in head and neck cancer patients on chemoradiation who underwent serial weekly PET CT during the first 2 weeks of therapy. Apart from the research work on the prognostic potential of pre- and post-therapy SUV max, research work in head and neck PET CT is also focusing on other markers of tumor metabolism in PET CT such as MTV and TLG. In addition, the benefit of PET/magnetic resonance imaging fusion and its prognostic potential is also being explored. The retrospective study reveals that higher values of the posttherapy SUVmax and smaller reductions in the value of posttherapy SUVmax correlated with higher risk of relapse in head and neck cancer patients undergoing concurrent chemoradiation, and that high pretherapy SUVmax values alone could not be taken as a prognostic tool. However, our study had its own inherent flaws in that it was retrospective in nature with limited data and included various head and neck subsites. In addition, the HPV and EBV status of patients particularly with oropharyngeal and nasopharyngeal sites of involvement was not analyzed the positivity of which could have favorably influenced the chemoradiation response thereby leading to bias. Furthermore, the follow-up period was short at 6 months, and hence, these survival values might have changed with longer periods of follow-up. Thus, the need of the hour is to conduct a prospective randomized study on head and neck cancer patients which would be subsite-specific with statistically powered number of participants with serial FDG PET CT done pre and post therapy for a minimum duration of 2 years' follow-up. Such a study might shed more conclusive proof on the findings of this study as well as change the treatment dynamics of head and neck squamous cell carcinoma in the near future. National Cancer Institute. Head and Neck Cancer. What are the Cancers of Head and Neck? Available from: https://www.cancer.gov/types/head-and-neck/head-neck-fact-sheet. [Last accessed on 2017 Oct 10]. National Institute of Health. U.S. National Library of Medicine. Genetics home reference. Head and Neck Squamous Cell Carcinoma. Available from: https://www.ghr.nlm.nih.gov/condition/head-and-neck-squamous-cell-carcinoma#genes. [Last accessed on 2017 Oct 10]. Iqbal MS, Chaw C, Kovarik J, Aslam S, Jackson A, Kelly J, et al. Primary concurrent chemoradiation in head and neck cancers with weekly cisplatin chemotherapy: Analysis of compliance, toxicity and survival. Int Arch Otorhinolaryngol 2017;21:171-7. Duprez F, Berwouts D, De Neve W, Bonte K, Boterberg T, Deron P, et al. Distant metastases in head and neck cancer. Head Neck 2017;39:1733-43. Mak D, Corry J, Lau E, Rischin D, Hicks RJ. Role of FDG-PET/CT in staging and follow-up of head and neck squamous cell carcinoma. Q J Nucl Med Mol Imaging 2011;55:487-99. El-Khodary M, Tabashy R, Omar W, Mousa A, Mostafa A. The role of PET/CT in the management of head and neck squamous cell carcinoma. Egypt J Radiol Nucl Med 2011;42:157-67. Robson A, Sturman J, Williamson P, Conboy P, Penney S, Wood H, et al. Pre-treatment clinical assessment in head and neck cancer: United Kingdom national multidisciplinary guidelines. J Laryngol Otol 2016;130:S13-22. Martin RC, Fulham M, Shannon KF, Hughes C, Gao K, Milross C, et al. Accuracy of positron emission tomography in the evaluation of patients treated with chemoradiotherapy for mucosal head and neck cancer. Head Neck 2009;31:244-50. Paidpally V, Chirindel A, Lam S, Agrawal N, Quon H, Subramaniam RM, et al. FDG-PET/CT imaging biomarkers in head and neck squamous cell carcinoma. Imaging Med 2012;4:633-47. Allal AS, Slosman DO, Kebdani T, Allaoua M, Lehmann W, Dulguerov P, et al. Prediction of outcome in head-and-neck cancer patients using the standardized uptake value of 2-[18F] fluoro-2-deoxy-D-glucose. Int J Radiat Oncol Biol Phys 2004;59:1295-300. Querellou S, Abgral R, Le Roux PY, Nowak E, Valette G, Potard G, et al. Prognostic value of fluorine-18 fluorodeoxyglucose positron-emission tomography imaging in patients with head and neck squamous cell carcinoma. Head Neck 2012;34:462-8. Zhang B, Geng J, Nie F, Li X. Primary tumor standardized uptake value predicts survival in head and neck squamous cell carcinoma. Oncol Res Treat 2015;38:45-8. Oruc Z, Emin Buyukbayram M, Kaplan MA, Urakcı Z, Küçükoner M, Isıkdogan A. Association between standardized uptake value and survival in patients with locally advanced or metastatic squamous cell head and neck cancer. J Oncol Sci 2016;1:1-4. Jeong Y, Baek S, Park JW, Joo JH, Kim JS, Lee SW, et al. Lymph node standardized uptake values at pre-treatment 18F-fluorodeoxyglucose positron emission tomography as a valuable prognostic factor for distant metastasis in nasopharyngeal carcinoma. Br J Radiol 2017;90:20160239. Moeller BJ, Rana V, Cannon BA, Williams MD, Sturgis EM, Ginsberg LE, et al. Prospective risk-adjusted [18F] Fluorodeoxyglucose positron emission tomography and computed tomography assessment of radiation response in head and neck cancer. J Clin Oncol 2009;27:2509-15. Matoba M, Tuji H, Shimode Y, Kondo T, Oota K, Tonami H, et al. The role of changes in maximum standardized uptake value of FDG PET-CT for post-treatment surveillance in patients with head and neck squamous cell carcinoma treated with chemoradiotherapy: Preliminary findings. Br J Radiol 2017;90:20150404. Hentschel M, Appold S, Schreiber A, Abolmaali N, Abramyuk A, Dörr W, et al. Early FDG PET at 10 or 20 Gy under chemoradiotherapy is prognostic for locoregional control and overall survival in patients with head and neck cancer. Eur J Nucl Med Mol Imaging 2011;38:1203-11. Kim S, Oh S, Kim JS, Kim YK, Kim KH, Oh DH, et al. Prognostic value of FDG PET/CT during radiotherapy in head and neck cancer patients. Radiat Oncol J 2018;36:95-102. Kim SG, Friedman K, Patel S, Hagiwara M. Potential role of PET/MRI for imaging metastatic lymph nodes in head and neck cancer. AJR Am J Roentgenol 2016;207:248-56.